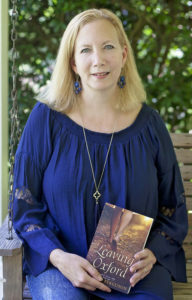 I’m Janet W. Ferguson, a Christian author with real life issues. I have anxiety. I’m a prodigal. My family is not perfect. My life is messy sometimes. Okay, a lot of times. The struggle is real. Hope and faith that Christ’s sacrifice is strong enough to cover all my mess ups. Hope and trust that God’s promises are true—He will wipe my tears, and death is not final. Some busy days, the hope is in the back of my mind, but other days, I must make a white-knuckled grasp of that hope to keep my emotions from dragging me into that spiral of anxiety. Hebrews 10: 23 Let us hold unswervingly to the hope we profess, for he who promised is faithful. So I write characters with messy, realistic lives, like me and the people I know. But I give them a happy ending…because I believe we all need that hope. The first book in my Southern Hearts Series is Leaving Oxford. 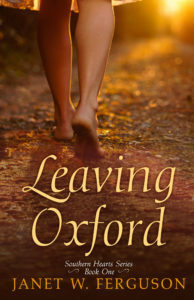 I’ll be giving away one EBook copy of Leaving Oxford to one person who comments by January 27, 2017. Hi Deana, First I’m sorry you have anxiety and PTSD. It’s tough, I know. Saying a prayer for you :) I try to write realistically for the most part. I’m not sure I know how to do anything else, LOL. I hope you enjoy Leaving Oxford. Leaving Oxford looks good, I will go check it out! Anxiety can be debilitating, it takes a lot of strength and support to deal with. I love that you have claimed God’s promises; it is sometimes an hourly prayer to get through the day (Hebrews 10:23 is a personal one for our family:) Blessings to you. Hi Wemble! I hope you like Leaving Oxford. It is the book of my heart. Yes,, anxiety isn’t any fun, but you’re right about claiming God’s promises. He is with us in our fires. I’ll go look up Hebrews 10:23! LOL, my brain! Hebrews 10:23 is what I wrote up top :) It is a good one. I am also struggling at the moment. My life is absolutely a mess! It is a very, very, very long story and not a lot of time to tell it. I know one thing : My God Reigns!!! Through everything He has been with me and I am never alone! He is the keeper of my soul. I have Leaving Oxford on my Kindle and after reading the excerpt, it’s moving up in the queue. I’m sorry to hear about your struggle with anxiety, Janet…praying for you. Thanks Janet for reminding us God is faithful, even when life is messy and especially when we are anxious. Our family has definitely seen God at work during some messy anxious times. I always enjoy reading stories with real life issues and Leaving Oxford sounds interesting. Thanks for sharing and happy writing. Hi Renate! Great to see you here! God is often more visible in our hard times, isn’t He? Maybe because we have to hang on tighter to Him. I hope you like Leaving Oxford! Thanks for sharing your inspiration for writing. Leaving Oxford sounds quite interesting. Hi Priscila! You’re welcome! The book was on my heart for about 7 years before I wrote the first word. I started writing it finally a few months after my parents passed away. I felt like it was time to quit thinking about it and do it. I hope you like Leaving Oxford! This book looks like the kind of stories that I like. Would love to win a copy but I am sure that whomever wins it they will enjoy it. Thank you for showing us there is light after the storm and blessings come even to the most unworthy. The struggle is definitely real but I am slowly learning to trust in God and not my own understanding. I have dedicated time to read the word and bible plans to deals with whatever situation I am going through. The Bible does have a lot of answers to what we are facing. Hi Colleen! I do continue to learn that trust lesson. I have to retake that class often, ha! You have a great plan with dedicated time. The Bible does have the answers! Hi Janet! I suffered from PTSD and anxiety for years. Psychotherapy made a huge difference but it wasn’t until the idea of “renewing my mind” clicked that things radically improved. Anytime an anxious or negative thought creeped in, I would repeat, out loud, a few quotes from scripture. I also learned deep breathing techniques that made a huge difference, especially at night! I love the premise of your book! Hi Josee! I’m so sorry you went through PTSD! I love that renewing the mind! Love that verse! I just went and looked it up. Do not conform to the pattern of this world, but be transformed by the renewing of your mind. Then you will be able to test and approve what God’s will is—his good, pleasing and perfect will. I like that you repeated scripture out loud. There is power in the Word! Yes, Let go, Let God!! I hope you like Leaving Oxford! Life can be challenging But…..GOD is everything! He strengthens and protects in the middle of messes. Blessings to you. Thanks for writing! Diana, I love what you wrote! God is everything! Thank you for the encouragement and blessings. Sending blessings back to ya!! This sounds like a book worth reading. I was just thinking yesterday that we need more stories that are closer to the messiness of real life. I struggle with depression yet I am called to teach. It is hard to share the truths of the Bible when joy is not evident in my life. It is only by knowing that I am loved by Jesus that Icontinue. I would love to read your book. At least your heroine can go home. Due to my dad’s vocation and now retirement in yet a different place I have no hometown. So even when there is a temptation to escape, there is no safe or familiar place to go except to the arms of God. God bless you in your writing. Your book sounds fantastic….I want to read it!!! Thanks for sharing your story….will be praying for you. My big challenge is health issues. Thanks for your giveaway. Thank you, Jackie! I hope it’s fantastic, ha! I did my best anyway :) I always appreciate prayers. Health issues are tough, too. Most women don’t like to have to get any help. We like to do it ourselves, and it can be so frustrating. Prayers for your health and healing. I hope you like Leaving Oxford. Good luck in the drawing! I loved Leaving Oxford and have the next two on my Kindle. LO was eyeopening, and I really felt for Sarah’s dilemmas. Well done! Thank you for being Real in your writing. Life is messy & nobody’s perfect! I wouldn’t be able to handle my life without Jesus in it. Hi Esther! You’re welcome! I’m not sure I know how to be something besides real, ha! I just wanted to stop by and congratulate you on your success with Leaving Oxford and the series. Hard work and talent pay off! Hi Tina!! Thank you for all your encouragement and advice over the years! You have been instrumental in helping me and so many other authors! You’re awesome! This book sounds so good.I love books that are real life. Thank you, Nancy! I hope you enjoy Leaving Oxford!! Thank you, Merrillee!! Hope you have a great day! I understand your pain because I suffer the same way. Large groups of people scare me. Hi Linda, Sorry you have to deal with that issue. It’s no fun. Prayers that it gets better! Next week I have to do public speaking. I do not feel comfortable with it at all. I probably won’t sleep the night before! I hope you like Leaving Oxford. I am always searching for new authors. This looks like a book I NEED! I am a caregiver to my elderly mother, and can certainly relate to anxiety and stress. Thank you for the chance to win a copy, but it will also be on my wish list in case another deserving person wins!! Blessings! Hi Susan! I have been where you are. It’s so bitter/sweet at the end of life. We cared for my parents. I worried a lot about my choices I had to make for them. It was all so hard, but now they’ve gone home to the Lord, and I miss them terribly. Prayers for you and your mother. I hope you enjoy Leaving Oxford! Good luck in the drawing. Real life with hope for a good ending…Love that. It’s how I like to write as well. Congrats on the new release. Realistic is so perfect. No one has a perfect life. It takes troubles for God to shape us into the person he wants us to be. And I always love happy endings. Reading is an escape from real life for me. Hi Gail! I love how you worded that about troubles shaping us. Yes, we are being refined, many times by fire, right? And you’re right, no one has a perfect life which makes us long for our true home. I have to have that happy ending, too! I love to escape in a great story. Diana, thanks so much for your words of hope and comfort I needed today in all my messes, both external and internal. I, too, am still a Mississippi girl, born in the Delta, though living now not far away in Memphis, so I am sure the setting and atmosphere of _Leaving Oxford_ would strike a chord with me. May God continue to bless you in your writing and comfort you in your anxieties as you keep on casting all your cares on Him. Hi Kathryn! Prayers for you today! The external messes are hard, but these internal ones are toughest for me. I hope things get better. I’m so happy to hear from a fellow Mississippian. I was born in Greenwood, but spent most of my life in the Jackson area. You will slip right into the setting of Oxford, for sure! I hope you like it!! Blessings and hugs sent back to you! Autumn, I don’t think we’ve met in person, but I can tell you are so sweet! We have to meet up at ACFW or something for coffee! Thanks for the prayers and hugs, and sending them back to you! Leaving Oxford is a great story! If anybody hasn’t read it you need to. Thank you, Jackie! You read it a few times in the making, and helped me improve! Blessings! I appear to be having one white-knuckled experience after another, starting with my hubby’s stroke in September and then…and then…and then… Thanks for the reminder that God is good all the time. Deb, No wonder! That’s tough. I know you’re exhausted and frazzled. Lifting you up in prayer for strength and refreshment and sending hugs. God is good all the time, but sometimes we need reinforcements/friends/prayer-warriors and a big inhale of His Spirit to get through the moment, the hour, the day. I don’t have any of your books, Janet. (yet) I have struggled in the past w/PTSD. It takes a lot of work and courage, but the Lord is on your side. He will help you. Thanks for sharing your struggles and writing honestly. I love that! You’re welcome :) Great to see you here, Judy! I’m so sorry you’ve been through that. People don’t understand until it happens to them how bad it is. Yes, the Lord is on our side, so thankful for that! Janet, I’m excited to see the success you’re having with your books. I hope God will continue to give you the inspiration you need. Many blessings to you! Blessings sent back your way! I would love to read your book. It sounds very good! Hi Angie! Thank you! Glad you said hello! Good luck in the drawing! I hope you like Leaving Oxford. Thanks for such an inspiring post, Janet! Love the scriptures you used. Look forward to reading your book!! We certainly all have issues of some kind. I’m thankful for authors who write realistically about life’s problems and show through their stories how God can help us. I’ve been seeing your books featured on other book blogs and am interested in reading them. Thanks for the chance to win a copy of Leaving Oxford. Hi, I enioyed this book. I work with teens that have different types of mental health issues and concerns. I enjoyed how she was able to little by little overcome her struggles. God bless!! I have been depressed for several days! Don’t know if it is anxiety or not! Would love to read your book. Hi Linda, Sorry it’s been a bad stretch for you. Prayers sent up to the Father and hugs sent to you over the internet :) Anxiety and depression can march together but not always. Can’t hurt to find out if it persists. I hope you like Leaving Oxford, and good luck in the drawing. I am learning to appreciate suffering for what God intends for it to do. I realize that I look for God in my suffering more than any other time in my life. I am always looking for scriptures that remind me of my hope in God. In that pain and suffering, scripture are our lifeline. I hope you like Leaving Oxford! Oh Teresa, I feel your pain! My panic attacks center mostly around driving on the interstate due to a wreck, (I’m not a fan of public speaking either, but I think that’s a different animal), but I think all panic attacks are the worst!! Then you worry about if you’re going to have them. I’m praying for you now for healing and God’s gentle hand on you when you feel like anxiety might come. Thanks for liking my page :) I hope you enjoy Leaving Oxford. I’ve put a bit a bit of my goofy humor throughout the story, so me and you don’t get too stressed, ha! Thank you Janet for your inspiring post. You have offered encouragement to many people. Hi Connie! I’m glad to offer hope! Thank you for your encouragement, too! Thank you for writing books with real characters with messy lives that are easy to relate to. Leaving Oxford sounds like a great book to read. I love happy endings. Hi Janet, I may know the cause of your anxiety. I retired from being in branch banking after 30 years in the largest bank in a SW state. I suffered from migraines for most of those years! Two years after I left banking my headaches disappeared to never return. Isn’t that a blessing? I want to read your book. I hope you enjoy Leaving Oxford!